Zalman has unveiled a new compact sized ultra-quiet CPU cooler targeting mini-ITX systems. The new cooler is called the CNPS2X (where CNPS stands for Computer Noise Prevention System). This compact solution uses a Direct Touch Heatpipe (DTH) 'S' bending system paired with an 80mm fan to offer 120W of thermal dissipation. Providing efficient, compact and powerful air cooling in the tight confines of a small mini-ITX case might be challenging but Zalman has designed the CNPS2X exactly for this purpose. 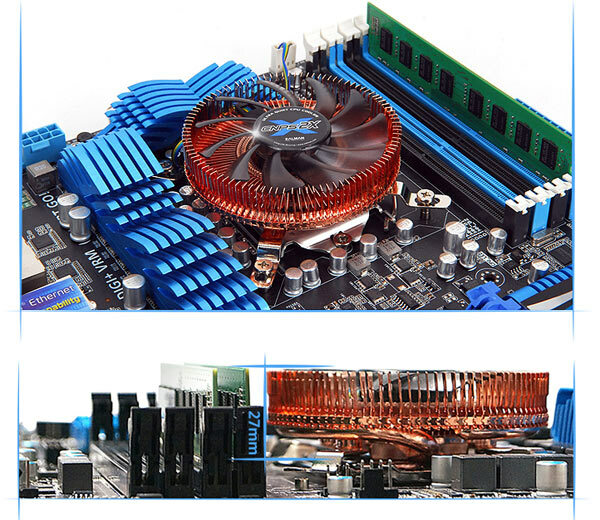 The specialist South Korean cooling company has designed this new cooler to cool almost any recent CPU; sockets Socket 1150/Socket AM2+/AM2/Socket AM3+/AM3/Socket 775/Socket 1156/Socket 1155 are all supported with all speeds and varieties of processors. (with the exclusion of AMD's AM3 and AM3+ parts with a TDP of over 120W). Please note that, looking at the small print for this cooler, it is a requirement that it be paired with a 120mm case fan. As mentioned in the intro, the Zalman CNPS2X uses a DTH system where the heatpipe intersects the CPU cooling block and actually makes direct contact with the CPU to maximise the transfer of heat away from the core. To minimise the size of this compact unit the heatpipe is shaped in an 'S' form, the whole of which is covered by the above fan unit. Fin design is also optimised for heat dissipation, in a flower shape, while being light and small. The fan doing the donkey work on the CNPS2X is a "low noise" 80mm PWM fan which can have its speed controlled by the user. The fan speed can be varied from 1,500 to 2,600RPM. Zalman's noise figures for the fan are 17.4 ~ 22.7 dBA ± 10%. The whole unit measures just 84mm in diameter and 27 mm high, also it's light at 83g. Zalman also provides purchasers with 1g of its own ZM-STG2M thermal paste compound. 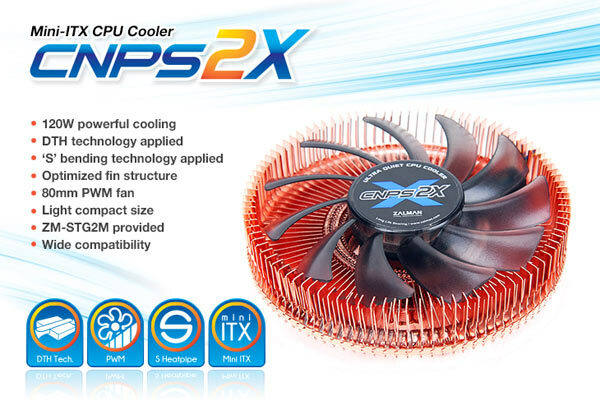 The CNPS2X cooler, complete with fittings and thermal compound, is expected to retail at around €25. Availability is slated for later this month. EKWB Vector Radeon VII water block launched Deepcool shares info about its patented anti-leak technology Intel Core i5-9400 PC Specialist Vortex S1 Has Samsung been chosen for Intel Xe GPU manufacturing? if it does AM2/3 it does FM1/2, the sockets are completely compatible (coolerwise, at least ;) ).